A unique thing has happened in Bunt this year, especially in regards to the economy for series cards as the chase award is available and after the chase award is expired. Because the market is activated each day with new cards, its very unusual the way they perform. Right now, there are hundreds of users who feel compelled to collect every set, mainly because its fun and challenging. They also have very nice collections to leverage in trade, as well as quite a few coins to buy packs as well. As a result of their demand, the set series cards can become quite valuable as long as the chase card award is still available. These users will drive up the price of the cards because they have the firepower to outbid just about anyone. Because many of the people who obtain the set cards in pack are not as “rich” in collection, to them, these trades are like hitting paydirt. I know this from experience. Im not even close to chastising users from overpaying for set cards, I am just explaining what happens. If they want to spend what they spend, that’s their prerogative, as they can do as they please with their cards. Actually these individuals arent even most of the problem, its the users who believe these cards retain the value long term, which just isnt the case. Its also not just the group of set collectors that drive up value, its the whole Bunt economy that is responsible for a lot of these strange phenomenon. Because the median age of user has dropped this year, and because many younger (and also newer) users dont really understand supply vs demand in game, things get very dicey. Bunt, in 2014, is all about new and hot. That is why 300 level sigs from weeks passed cant be traded for 400 level sigs released this week. New is better, and funny enough, that is exactly how real cards work too. The things that get complicated are what happens when an economy is built up around a card’s value which eventually PLUMMETS as something new hits the market. Lets say you are lucky enough to pull a hot card, which has happened to me a few times this year. It is in your best interest to trade immediately. Its hypocritical of me to comment negatively on the new tendencies and then encourage people to ride the wave, but I digress. You can get more when something is hot, and unless it is an ULTRA RARE release, its likely you can trade back for it later when value drops. 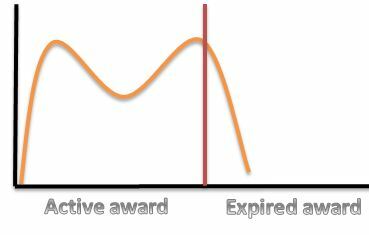 Here is how I see the value of set cards – with the orange line representing value and the red line being the time the award expires. Of course my assessment is simplistic, but regardless of cool factor or rarity, this represents the value of a set card. It will be worth most at release and most at time to of expiration. After that value will decrease exponentially as users move on. As with any capitalism inspired economy, it behooves you to sell at the highest possible point and buy at the lowest. If you are not like me, and can stand to wait out the value, it will be in your best interest in the long run. Let the market run wild, and pick up the pieces when its over. When it comes to any Signature series card, things change a bit, so please do not use this method with any of the sigs. At that point, extreme rarity can improve value over time, which will mean it may not be best to sell right away. It really cant be fixed in any short term fashion, as its clear that the new set structure will only serve to promote this situation. In earnest, its best to just play your cards right (pun intended), and know how to operate within the system. Buy packs when the cards are new, and see if you get lucky. If you buy enough, you will likely get lucky at some point. There is also a point to people’s willingness to overpay, so I would ADVISE AGAINST counter offering when you eventually get that blockbuster deal. Either take it or leave it, because it has likely been offered to enough people that someone will accept. They will have no problem waiting that out. Also, when the award expires, you have likely missed your chance. Do not go offering the cards to people and expect them to pay what they did when the award was active. You will either get 1-starred or ignored and that’s not good. If you have any questions, shoot me a 1:1 same card trade and ill do my best to let you know what I think. I think you need to give more information about which cards are “hot cards”. For the series where they release everything at the same time (like the Upper Class series this week), the Super Rares are the ones to covet. If you happened to pull a Super Rare Trout, Felix, or Cano Upper Class… you hit paydirt! You can trade that for a sig+. For the series like Silver Stars or Future is Now 2 (the other 2 series this week), it seems to be whichever is the lowest count card available at that moment. So if you have that card, you can trade it for more than the eventual card count will justify. For example, someone offered me a David Wright black boost this week for the Sonny Gray Future is Now (and they gave me the Future is Now Bogaerts). I accepted in a heart beat! I tend to do all of the chases but I have a specific strategy for doing so. Happy to explain more in the future.